Work on the next version of Windows 10 continues while Microsoft is still preparing Windows 10 version 1809 for a re-release after the botched initial release of the new feature update for Windows 10. Windows 10 Insider PCs get new updates regularly and many of them introduce new features or changes as development is still in a phase in which new features and changes are added. The most recent update, Windows 10 build 18272, introduces several new features and many or even all of them will land in the next feature update for Windows 10. 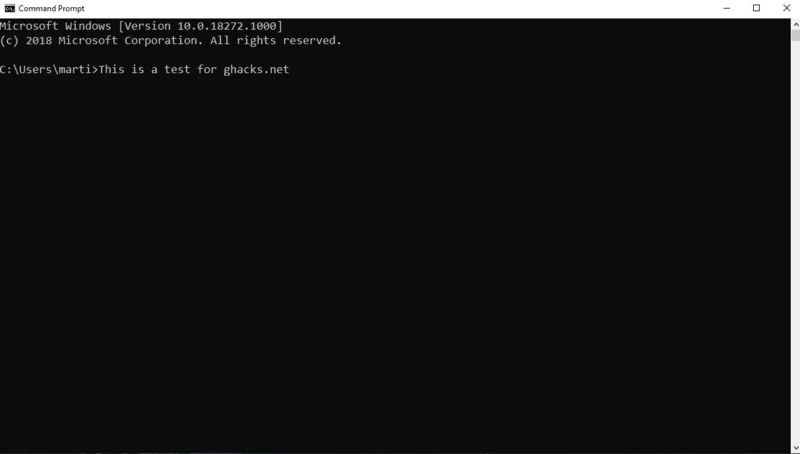 Tip: find out how to open command prompt windows quickly. One of the new features introduces zoom support in Command Prompt, PowerShell and Windows Subsystem for Linux windows. Ctrl + Mouse Wheel Scroll to zoom in text is now supported in Command Prompt, PowerShell and WSL. All you need to do is hold down the Ctrl-key on the keyboard and use the mousewheel or trackpad to zoom in or out. The shortcut is the same that you may use in modern desktop browsers to zoom in or out of page content but the effect is different. When you zoom in browsers, zoom is applied only to the displayed page but not to the browser interface. The new zoom feature that Microsoft added to consoles in Windows 10 applies the zoom effect to the entire window. The entire window is zoomed when you use the Ctrl-Scroll option to zoom so that it almost feels as if you resize the window while new text sizes are applied based on the new dimensions of the window. The method has its limitations considering that you may not want the console window to become larger than the visible part of the screen.It is mostly useful for changing the text size quickly and temporarily. The effect lasts until you close the console window. Options to change the size of console windows are already available in current versions of Windows. Just open the window properties with a right-click on the console window title and switch to the layout tab to change the size of the initial window and make the new size the default. Microsoft could adjust the feature in coming builds to limit zoom or add other functionality that changes zooming. Windows Console windows support options to change the font size, type and other parameters already. A right-click on the window title and the selection of properties from the context menu opens a configuration window. The font tab lists options to change the font size and type. 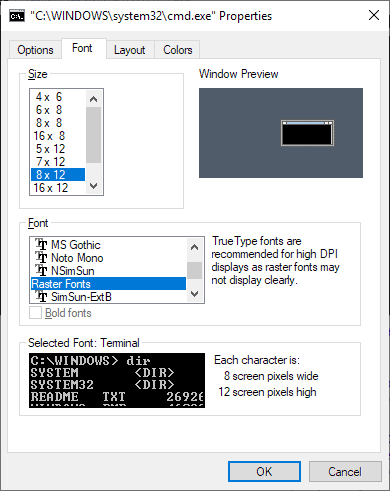 The customization option is useful to users who prefer a larger font size or different font type when they use the console on Windows. Now You: is the new feature useful? what is your take? Microsoft plans to add a zoom feature to Windows Console windows, e.g. the command prompt or PowerShell, that allows direct zooming. Windows users have been waiting for this since the ages of Windows 95. This is the best day in my life. Finally I can die peacefully. 3Gb of upcoming 1903 ISO to include ‘prompt zooming’. Great. And they are unable to release 1809. Greater. It is kind of laughable they still continue to remove and add “feautures” in Windows 10 when it is loaded with bugs and non/half-working stuff…. LTSB 2016 still going strong – as a virtual machine that seldom are allowed online though (all updates stopped as long as i want to – can’t be bypassed by Microsoft ! Not even via the backdoors !!! ).